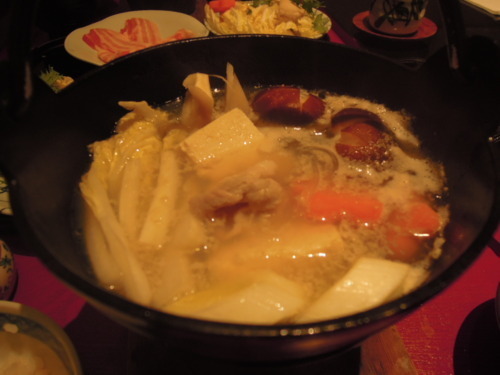 In the depth of British winter, I would often have massive cravings for shabu-shabu, which is a Japanese dish which involves cooking fresh meat and vegetables in your own pot of simmering broth or water. 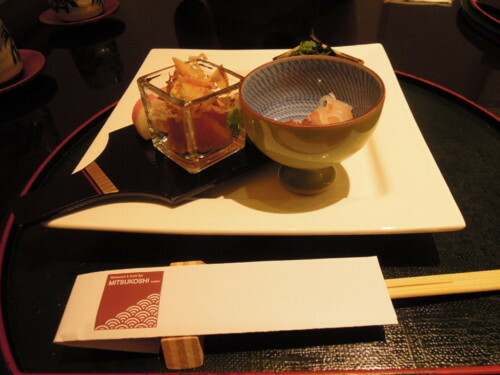 Mitsukoshi Restaurant is a Japanese shop first established in 1673 selling kimonos, which later developed into a department store with branches all over Japan and in the rest of the world. While restaurants around Piccadilly Circus are typically very touristy and overpriced, Mitsukoshi serves traditional, honest Japanese food. The Mitsukoshi department store sells European designer items, and is frequented every day by Japanese tourists who want to be served by Japanese-speaking staff. With such clientele, it is no surprise that Mitsukoshi is under pressure to serve authentic food that will not disappoint their fellow countrymen. 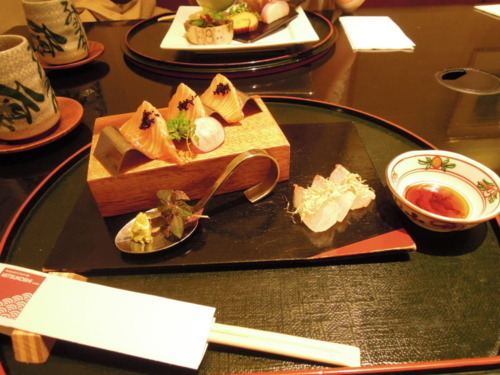 The interior of Mitsukoshi strongly resembles that of a typical Tokyo restaurant, except that it is more spacious. Tables are far apart to ensure privacy, and the Japanese staff are polite and efficient. (1) Inside the glass container of this assorted traditional new year’s appetizers was some beautifully marinated fish roe. Behind the bowl, there were also a few adorable little pieces of Japanese cakes, which are typically eaten in Japan to celebrate New Year. (2) The seared salmon and french sea bream sashimi was lovely and fresh, and came with a mild and refreshing citrus dressing. (3) Below is the Spanish pork shabushabu with grated radish and citrus dipping sauce, accompanied with rice, miso soup and pickles. 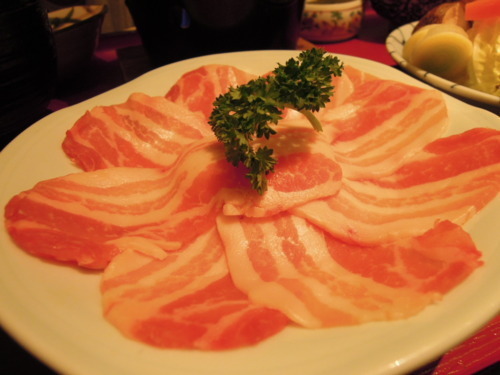 The Spanish pork was beautifully fat marbled and tender, and were neatly arranged on a plate. 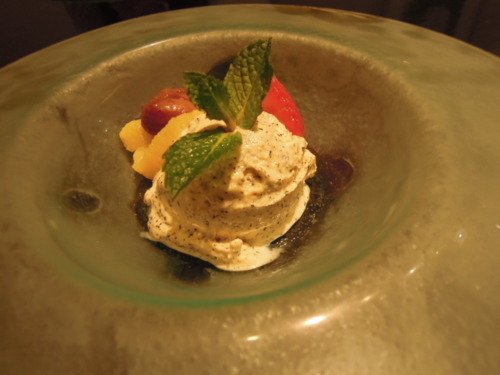 (4) For desserts, we had a marvellous home made hoji-cha ice cream with “kuri kinton” chestnut and sweet potato paste. The scoop of ice cream had delicious bits of ground hoji-cha leaves in it, and the chestnut and sweet potato paste also turned out to be a delightful combination with ice cream! Instead of scooping out the ice cream right before it is served, some Japanese restaurants would prepare the dessert beforehand and put the whole plate into the freezer (see the water vapour in the picture below). This is what we call asian efficiency!